Source of title proper: Title based on source of fonds material. 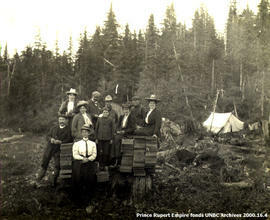 The "Prince Rupert Empire" was the first newspaper in Prince Rupert, B.C. The newspaper became defunct in 2010 after its acquisition by Black Press. The collection consists of 9 photographs and copies of photographs showing scenes of Prince Rupert and area, groups of townspeople, a stone totem pole at Metlakatla, and a man poling a dug-out canoe probably on the Skeena River. It includes two newspaper clippings, one from the BC Saturday Sunset dated September 14, 1912 and another from The Globe dated Saturday March 23, 1907. The bound volumes of the Prince Rupert Empire newspaper were transferred to Special Collections. See accompanying note. The bound volume of the Prince Rupert Empire newspaper is available from Special Collections, Geoffrey R. Weller Library, UNBC under the title “The Empire: Prince Rupert, British Columbia”. This bound volume contains the first twenty-six issues of the Prince Rupert Empire, Prince Rupert’s first newspaper, dating from Saturday July 20, 1907 to January 11, 1908 and inscribed to Mrs. Robert L. McIntosh, wife of Prince Rupert’s first postmaster and signed by the newspaper’s proprietor Mr. John Houston on June 22, 1908.